As you may know already, with your help I’ve created two previous Thank You / Congratulations cards to send to the Disney Infinity team the past two years when the game has launched. But this year, this one will have much more special meaning. Obviously yes, this is a game that many of us have invested a deep amount of money into. So some may say “Haven’t we thanked them enough?”. But, I know for myself and thousands of you who I’ve interacted with over the course of this website, Disney Infinity is something special. It goes beyond “just a game”. For the team itself, a lot of them we know by first names, we know their life story, we know their families, etc. It’s one giant family. 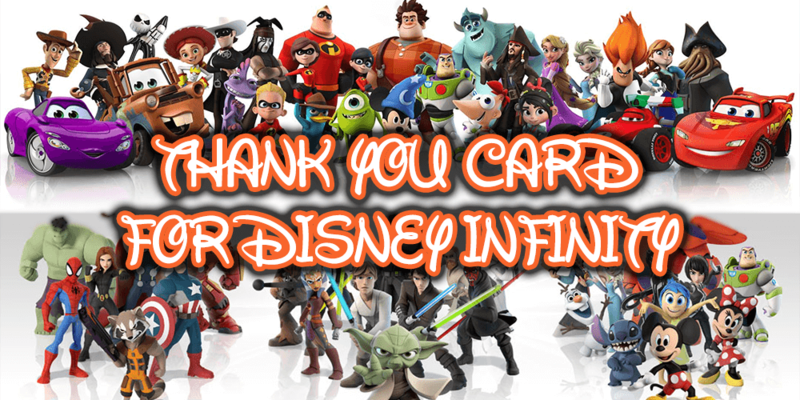 So before this Disney Infinity chapter is closed, I wanted to create one last large “Thank You Disney Infinity!” card to send off to the teams. You can share a simple thank you, who your favorite character was, a funny story, or a longer section saying why the game meant so much to you. It’s up to you! I’ll get everything put together and deliver them to the team in a couple of weeks. Simply head to the bottom of this post to fill out the form, or you can also head directly to the dedicated form page if you’re having issues. Deadline is May 30th, 2016.